You may have accidently pinched a nerve in hip when nerves in your midsection are compressed or stretched. You have to use your midsection to stabilize yourself, so any nerve impingement in this area can cause serious pain. In many cases, a pinched nerve is actually the result of a herniated disc. Let's find out more about it. What Causes Pinched Nerve in Hip? Nerve impingement in your hip can cause severe pain. It is important to talk to your doctor to help determine exactly what has caused the issue in the first place. Here are some possible causes of nerve pain in your hip. You get a pinched nerve when it is pressed by ligaments, bones, or tendons. Not paying attention to your posture and staying in the same position for a long time can cause a pinched nerve. You may experience a pinched nerve when constant pressure affects the protective fluid around that nerve. This significantly increases pressure and leads to severe pain. You have a bone spur, which is actually a pointed outgrowth of bone. This outgrowth can put pressure on the nearby nerve and cause pain. You have a herniated disc, which occurs when your spinal disc becomes weak. It can cause severe pain the hip. It is important to identify the exact cause of your pinched nerve in hip to ease it, but you can try some ways to keep your pain under control. There is a small muscle in your lower back called the piriformis that attaches to the pelvis. You may experience nerve pain due to piriformis syndrome, which is the result of your piriformis muscle putting pressure on the sciatic nerve. Sit in a chair with your back upright and feet on the floor. When you have hip pain on your left side, simply place your left ankle on top of your right knee with your ankle bone a couple of inches above the kneecap. Let your left knee drift towards the side and then lean forward to feel a good stretch in your left hip and lower back. Maintain this position for 10 seconds and then return to the starting position. The hip flexors are located on the upper area of your thigh. They start at the pelvis and can cause pain when become shortened or tight due to too much sitting. Get in a lunge position and keep your front foot a few inches ahead of your back foot. Keep your knee bent at a right angle. Ensure that your back foot is the one causing pain and needs stretching. 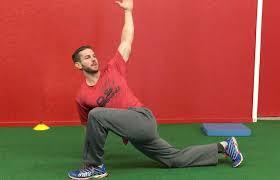 Slowly lunge forward until there is a light stretch on the front side of your back thigh. Maintain this position for 10 seconds and return to the starting position. Tight outer hip muscles can also exert pressure on nerves and cause severe pain. Here is how you can stretch these muscles. Stand in a comfortable position with the leg of the affected side behind your other leg. Now, push your affected hip outwards to the side and lean sideways. Now, lift your arm on the affected side and put it over your head to feel a stretch. Maintain this position for 10-15 seconds and then return to the starting position. You need to take plenty of rest when you develop nerve pain. Do not overwork or strain your painful hip. Give it a break for some time and allow your body ample time to repair it. Apply heat and ice. You should use heat and ice packs alternatively to ease pain and inflammation. Start with an ice pack applied to the injured area. Then you should use a heat pad on the same area. Ice works great to reduce swelling, whereas heat improves blood circulation to the area. Use a splint. If you can wear a splint on your hip, you should try it for sure. This helps limit the movement of your hip and help reduce pain. Consider losing weight. You may feel better by losing some weight because excessive fat layers may be putting pressure on your nerve and causing severe pain. Just keep in mind that you should try this option if you are already overweight. Do not put strain on one leg only. Many people do it unintentionally and put too much strain on their one leg only, which overtime leads to bad posture and excessive pressure on the nerve. Make use of essential oils. You can use rosemary, lavender, or thyme essential oils to help relax your muscles and body. These essential oils also possess antispasmodic and analgesic properties, which is why they help reduce muscle spasms and prevent nerve pain at the same time. Topical application of these essential oils will also help improve blood circulation to the affected area and help reduce nerve pain.